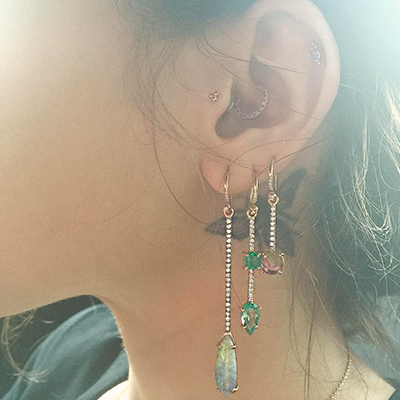 Cool girls with multiple piercings who want to create unique collections up and down their lobes have been into buying single earring styles for a while. Well, now Irene Neuwirth has added something new to the mix. The designer’s gorgeous stick earrings infuse an air of art deco elegance and old school glamour into an earful of ear cuffs, climbers and studs. 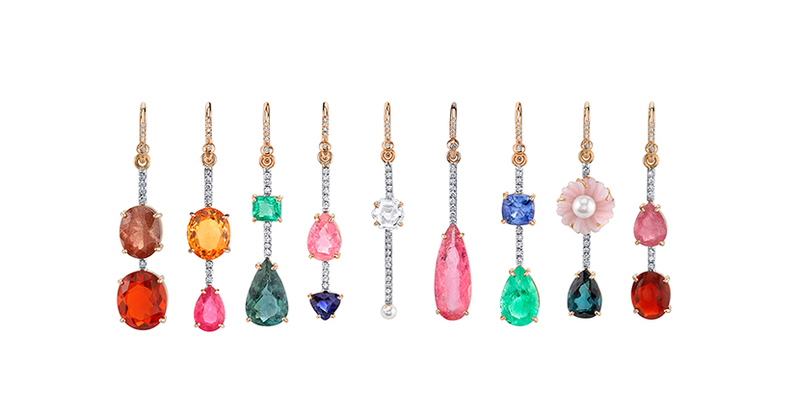 Each of Irene’s earrings is one-of-a-kind featuring a range of colorful gems. Some of the hot rocks in the earrings above are fire opals, emeralds, tourmalines, sapphires and pearls. There is even a carved pink opal flower. All of them are pavé set with diamonds. One of the best features of the single sticks is that they come in a variety of lengths. This feature takes the look to the next level of individuality once they are worn in multiples. Coolest of the cool girls, designer Pamela Love, proved the point when she sported three of Irene’s earrings at the 2016 CFDA Awards to support Neuwirth’s nomination in the Best Accessories category. The single earrings by Irene Neuwirth are available at Barneys.com.